As Christians we should be grieved by these numbers. Why? 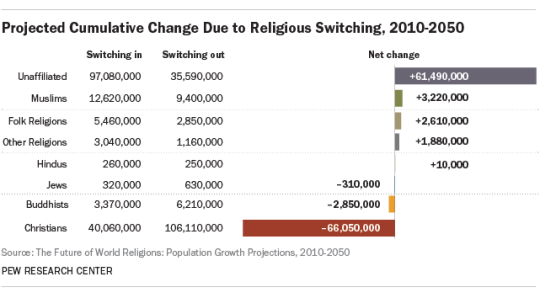 Switching in means the number of people going in to that religious group while switching out means the number that are leaving the group. The net change reflects the total after all the switching into and switching out of takes place. As Christians this should bring inspiration to pray, pray, pray and then act, act, act. Because, prayer without works is dead! There are more people disassociating themselves with Christianity than ever before. Ask yourself this question, why is that? WE, this means you as well if you’re a Christian, are the church! 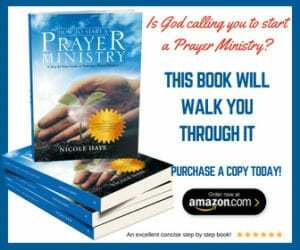 Not just the pastor, or the priest, or your bishop or apostle…you! What are you doing to bring more people into the fold? What can you do to change this picture? What will you do to build up the kingdom and call the 61 Million unaffiliated population into Christianity? Father God, You have called us to be salt and light to this world. What good is the salt if we’ve lost our saltiness? It serves no other purpose but to be trampled underfoot. Bring back our zeal. Uproot the fear in our hearts. Bind up Selfishness. Loose Selflessness. Bind up Apathy and loose a desire to see souls won for your kingdom. Bring the conviction of the Holy Spirit upon us. May this year be the year when your church truly wakes up to see that we must accept responsibility to do the things that only we can do. Stir our spirit and give us no rest until we act. We must act! Let us be not only hearers of the but doers. Show us what to do. Give us a spirit that perseveres and follows through. Show us the ones around us that we need to lead to You and show us how to minister to others. As we look to build your Kingdom we know you will take care of our needs for your word says that if we seek your Kingdom above all things then all the things we need will be added to us. Strengthen us by your Spirit and give us boldness. Fill us with your love so that we will share in love, in Jesus Name, Amen. Here is the Gospel of Jesus Christ. What are your thoughts on this? Give us some feedback in the comments below. We would love to hear from you.